One: You’re likely to be poor. Very poor. 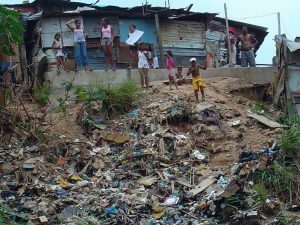 At present 52% of Venezuelan households live in extreme poverty, and another 18% live near to this mark. Venezuela recently replaced Haiti as the poorest country in the Americas. Considering that in the 1970’s Venezuela was the richest country in South America, something terrible must have happened. That something was socialism. 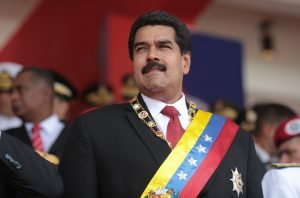 Venezuelan President Nicolás Maduro looking suitably like a proletarian son of the soil. Nothing’s too good for the workers. Venezuela has high unemployment, with 20% of the labour force not in work. The IMF projects that this is likely to rise further, hitting 26% in 2019. By comparison the figure for the decadent capitalist United States is 4.4%. Shame on them. Even if you are lucky enough to have a job, you’re earnings soon won’t be worth much. This is because Venezuela has horrendous inflation, with prices increasing by 400% last year. So any Venezuelan currency you earn, unless you spend it almost immediately, won’t buy you a great deal. To put this in perspective there was recently controversy in Britain when the inflation rate hit 2.3%. Doubtless partly linked to its economic meltdown, Venezuela has an appalling crime rate. In 2015 the country’s capital, Caracus, gained the dubious distinction of being the city with the highest murder rate in the world not actually at war. As a result of both hyperinflation reducing the incentive to sell, and general poverty, Venezuela has been affected by shortages of various basic goods. As a result the Government was forced to introduce food rationing in 2014, and electricity rationing in 2016. Other countries have managed to get through major wars without resorting to this. 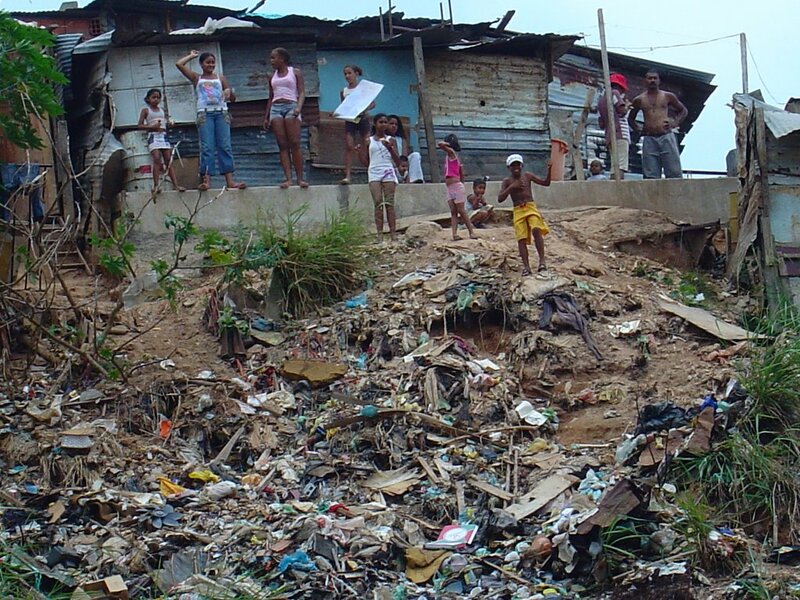 A scene of poverty in Caracas, capital of Venezuela. Now I know that technically this falls under basic goods, but I decided that toilet paper shortages are so visually iconic, and representative of socialism, that they deserve a category in their own right. Venezuela has been suffering from a toilet paper shortage for years. In 2013 the Government responded in the standard socialist manner, by seizing toilet paper factories, but this only made the problem worse. Currently toilet paper stocks across the country are very low, and many hotels advise foreign travellers to bring their own supplies. It seems that socialism doesn’t do much for your personal hygiene. For those of us accustomed to living in countries where we can say more or less what we like, Venezuela is likely to be a shock. The Government has shut down or taken over much of the independent press, whilst according to Amnesty International ‘Political opponents and critics of the government…face imprisonment’. The Venezuelan Government claims the country is a democracy, and elections do periodically take place. But this is largely a façade. The Government, including the security forces, openly intervene to help the ruling party whilst just about no one trusts those who count the votes. In 2016 the Economic Intelligence Unit’s Democratisation Index gave the country a score of 4.68 for its democracy, with 6 being the minimum to qualify even as a ‘flawed democracy’. So you’re poor, politically repressed, quite possibly unemployed and struggling to find basic goods. What could make the situation worse? How about leftist Western celebrities turning up for a few weeks to tell you how wonderful your life is, before jetting off home? Actors Sean Penn and Danny Glover have made pro-Government trips to the country, in the latter case addressing a pro-Government rally in 2014. Leftist director Oliver Stone made a pro-Chavez movie titled ‘Mi Amigo Hugo’ (My friend Hugo). A number of British leftists, including the current Shadow Home Secretary Diane Abbott and writer Owen Jones, have also made sympathetic visits to the country. They never stay long of course. It’s almost as though they rather like living in the capitalist West. A lot of Venezuelans, for fairly obvious reasons, aren’t very happy with their Government. They don’t much enjoy being poor, underfed and oppressed. 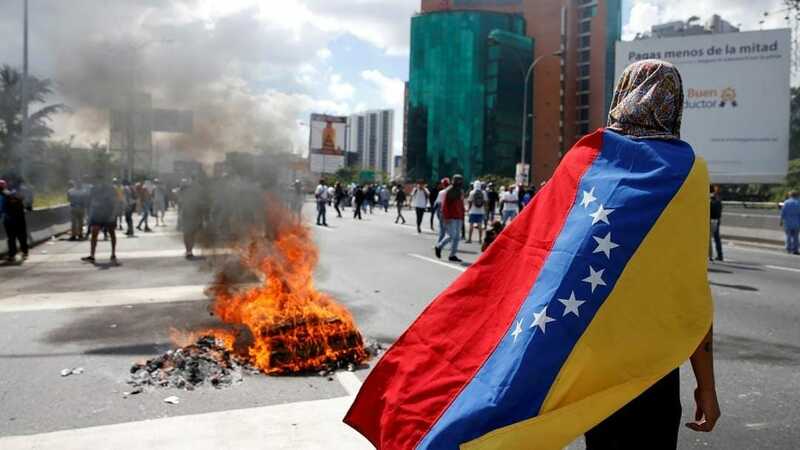 And as Venezuela isn’t a true democracy they have no option but to take their objections to the streets. The past few years have seem enormous anti-Government rallies, many of which have descended into violence. When the pro-Government Supreme Court dissolved the National Assembly earlier this year, it triggered an ongoing crisis which has left dozens dead. Thus, especially if you live in a big city, there’s a very real risk of getting caught up in political violence. This unrest has been intensifying for years, and given that the economy is on the verge of collapse, has the potential to become revolutionary. What’s this? A reenactment of some medieval battle? 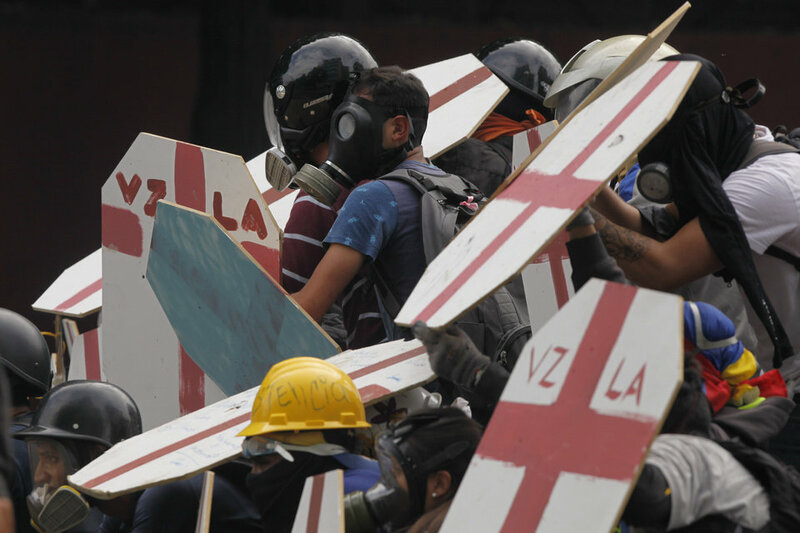 Nope – its an anti-Government protest in Venezuelan capital Caracas earlier this month. The shields are to provide protection from rubber bullets.